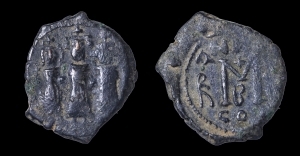 Lot 19124 - HERACLIUS. 610-641 AD. 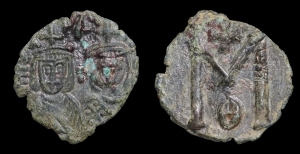 AE FOLLIS. 7,70 gr. - 24,5 mm. 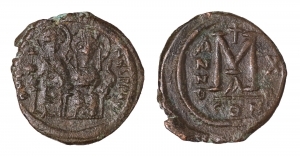 O:\ Heraclius (in centre), Heraclius Constantine (on right) and the Empress Martina (on left) all standing facing; each wearing crown and chlamys, and holding globe crossed in right hand. R:\ Large M surmounted by a cross; to left Monogram, above ANNO; to right numerals representing the regnal year, in ex. CO. BMC 181-94.